Skyrim? It’s an odd name with which we’ve been grappling for a while – the game tends to settle on ‘Sky-rm’ as its pronunciation. It’s an area in north Tamriel, where Nords live in frozen highlands, oppressed by the same Empire you spent all that time preserving in Oblivion some 200 game-years earlier. The Skyrim bit isn’t the most important part of the name, though; that's the Elder Scrolls prefix. From the start, Skyrim is classic Elder Scrolls. From starting as a prisoner (in this case, somehow bundled into a cart with the chief rebel Ulfric Stormcloak on the way to his execution) through the dungeon design, to the densely populated towns and map, everything is so Elder Scrolls. For example, there’s still the incongruity of well-tended braziers in dungeons, despite them being home to a black bear or giant frost spiders. Who sneaks into the cave, carefully avoiding the gnawed human bones scattered around the lair, to keep these braziers lit? There are also the disposophobic tendencies – you know that you’ll need loads of gold to buy fancy armour and magic weapons. By the end of the first dungeon we’d taken enough food to have a dinner party for seven, and had enough kit to equip all the guests with armour and a weapon. We’d even helped ourselves to crockery, serving baskets, mead, kettles and lanterns. In fact, it didn't take long for us to become adept at only taking high gold-to-weight ratio items. As this is an Elder Scrolls RPG, you’re also encouraged to ignore the main route through a dungeon and find dead ends that almost inevitably have treasure to loot. This is taken to extremes in some dungeons, with long tunnels that initially seem to be leading nowhere suddenly yielding a room full of urns and chests and other pointless furniture for adventurers to loot. However, in many areas Bethesda has removed the temptation for such contrary gameplay habits – there’s no need to play silly sods with levelling up, as in Oblivion*. Instead, once you’ve accrued enough skill points to level up, you’re merely asked whether you want ten points of Magicka, Health or Stamina. You can then assign a perk point to any of the skill trees for a specified bonus (or keep it for later). There’s no need sleep to reflect on what you’ve learned either. This is your skill tree. Have you seen another so pretty? The skills are presented as constellations of stars – from Heavy Armour, through Smithing to Pickpocketing. 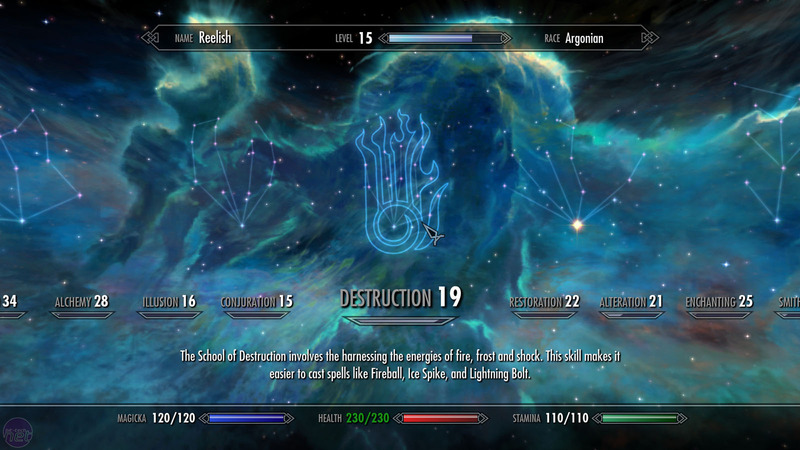 Not only is this system the most beautiful level-up system known to man (or argonian, in our case), but it’s simple to use. Reduced to its fundamentals, the level up system is merely a carousel of small, individual skill trees that you can navigate with A and D, the arrow keys or the mouse, but it’s amazingly intuitive and much more engaging than lists and progress bars. Sometimes the switching from one star (perk) in a constellation to another goes wrong, but largely the system is excellent. As are the menus themselves. The boring layout of a character surrounded by equipment slots has been ditched in favour of slick, clean menus. This might sound boring, but it works brilliantly, as you can quickly navigate via the WASD or arrow keys or mouse, depending on how you’re feeling. 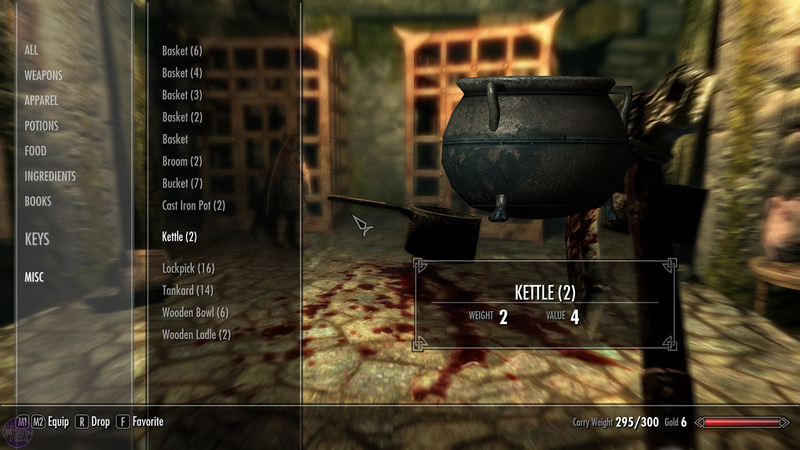 Skyrim also does a brilliant job of distracting or surprising you with interesting things to do. We really should have talked about dragons and Shouts and all kinds of stuff by now, for example. *For example, if you wanted to ensure that you got the maximum +5 health every time you levelled up in Oblivion, you needed to ensure that you had progressed ten points in Endurance skills. This meant stopping every so often to find a mud crab to attack you (to increase your Block and Heavy Armour skills) while you stood and did nothing but cast a Heal spell or drank health potions you’d just crafted. It also meant keeping a tally of your skill levels after each level up, which at least one of us actually did. Fun, eh? Playing Skyrim properly for the first time has filled Jake with an urge to explore.